It was not until the middle of the eighteenth century that the foundations of the society of the estates came into motion. However, the music as a social art form usually followed the anti-hierarchical path. All the court-dances of the 14th / 15th century were original folk dances had been borrowed from folklore and the lower classes. The highly stylized court dances formed an essential part of the stiff court ceremonial, but they originated in the popular culture, the customs of the lower classes. With the program “hullygully”, zeitgeist devotes its work to the music played by the common people and its later form at court. The ensemble illuminates melodies of the ancient music from various social-historical stands / points of view. zeitgeist improvises in “sensual, wild and unbridled character” (Curt Sachs) about folkloric dances. Well-known melodies of the art music resound in possible original forms. Born in Vienna, grew up in Regau, Upper Austria. 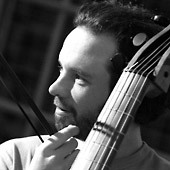 Daniel Pilz studied classical guitar with Inge Scholl-Kremmel and Viola da Gamba with Pierre Pitzl at the Vienna Conservatory, he attended master classes with Wieland Kuijken and Vittorio Ghielmi. He also studied various historical instruments such as Renaissance and baroque guitars, Colascione and Chitarra Attiorbata. Daniel Pilz played CD-recordings in the ORF Edition Early Music, for the German Harmonia Mundi, Accent as well as for the German Grammophon. Further, he has been and still has been in theatrical productions, e.g. “Mater Dolorosa” with Michael Niavarani in Globe Vienna, “Der goldene Apfel” at the music festivals Potsdam Sanssouci and Agathes Wunderkoffer with Veronika Mandl in the music club “Mater Dolorosa” at the Vienna Music Festival Vienna, “Richard III” and “Romeo & Julia”. Daniel Pilz is a guitar teacher at the music school St. Andrä-Wördern and is dedicated to the teaching of a broad range of musical styles. He lives and works in St. Andrä-Wördern and Vienna.